Nokia 770: finally a decent mobile browser! 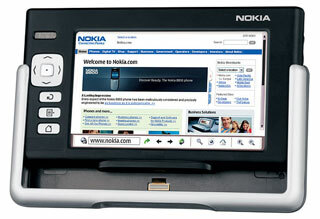 Russ thinks, Nokia's latest 770 Internet Tablet doesn't make much sense in today's market. Well, I think it does! Okay well, I wrote this split up theory between the screen and the phone over two years ago. Today I can't help but thinking they're finally getting it! Basically, this device is a standard web browser on a portable large (800*480) color screen, connected to the internet via WiFi (Home or Hotspot use) or Bluetooth (on the move use with your EDGE or 3G phone). This device is for you to read news (or whatever) in your rocking chair. You've tried it with a laptop before; it's not comfortable! You may have tried it with a tablet PC; it's still too heavy! This device is for you to read news or e-books (or whatever) in the bus/train while you commute. You've tried it with a PDA bedore; but... eh... the screen is too small, isn't it? (Anyway, it is definitely too small for the vast majority of websites out there today with no damn clue about mobile users). 1) Many people prefer devices that do one thing and do it well! (This is also why the Sony PSP would not be a significant competitor even if it had the required news reading software). 2) This is an entry level market testing prototype. Product cycles are short. This time next year, you'll have your keyboard and your hard-drive for the same price tag and in a smaller form factor. (Plus, with this new Linux based "Internet Tablet 2005 software edition" OS being available for some time, you'll also have a ton of ISV software available too). Seulement voilà: qu’est ce qui va empêcher les spammers de tous bords de tagguer leurs pubs pour sites explicites, agrandisseurs d’organes et autres pillules azurées avec tous les tags populaires du moment? Une chose est intéressante cependant avec le concept des tags: la possibilité donnée à des tiers d’ajouter des tags à un contenu qu’il n’ont pas eux mêmes produit. D'après un post-it qui traine sur mon bureau depuis plusieurs semaines, les français passeraient 32% de leur temps libre devant la télé et 22% de ce même temps libre sur l'Internet.